Pitbull gets Interviewed by Billboard. Pitbull recently got interviewed by Billboard’s Leila Cobo and he talked about, “Dale”, his Vegas residency, Trump and more! So when it came to titling his first Spanish-language album since 2010’s Armando, it’s no surprise Pitbull (real name Armando Pérez) came up with Dale. And not just any “Dale.” During a flight with producers Jorge Gomez and DJ Chino, his longtime on-the-road DJ and now co-producer and writer, Pitbull came up with an acronym for Dale: Disfrutando (Enjoying), Armando, Locuras (Craziness), Etc. “We did it while having a party at 45,000 feet in the air,” Pitbull tells Billboard with a laugh. On the eve of Dale’s release on July 17, Billboard spoke to Pitbull about an album that’s already delivered a handful of hits, his collaborations with new musical acts and, yes, about Donald Trump. You’ve always mixed Spanish into your English songs and conversation. How do you decide what words to use in your songs and when, for example, you host the American Music Awards? I don’t choose anything. I just talk. I don’t overthink it. I don’t have to oversell the fact that I am who I am. I’m the epitome of the American dream, the underdog, the fighter, the forever hungry, forever appreciative, that’s me. And no matter whether I speak Spanish, Portuguese, English, any language, we speak the most powerful language which is music. No matter what words we throw. While all Latin crossover acts have gone to pains to differentiate both their careers and languages, you’ve capitalized on being Latin. I don’t think it’s about capitalizing on being Latin. It’s just who I am and how I’ve grown up. I don’t think a Jamaican artist capitalizes on being Jamaican. He just grew up listening to reggae. It is what it is. Same thing with an African-American who grew up in the Bronx. It’s not about capitalizing. I think we have to be real careful on how we throw culture around because it’s not about capitalizing from our culture; it’s about teaching people about our culture. That’s why I’ve strayed away from, ‘Oh you’re a Latin artist.’ No, I’m an artist that happens to be Latin. That doesn’t mean that I can’t rap with the best of them just because I’m Latin. You started your career at a time when Spanish just was not part of popular culture nor was it heard on mainstream pop stations. Yet you’ve very aggressively put your “Latin-ness,” if you will, in the music and the words and everything you do. Were you ever concerned it would limit the places where your music could be heard? Why a Spanish album now? It was time. We had a bunch of records we were sitting on. DJ Chino and Georgie basically produced pretty much all the album and we had amazing features. I said, why not? And our first record, “Piensas,” went No. 1 with Gente De Zona. Bottom line it was just time. Tell me about some of the other featured names on the album. Osmani Garcia (featured in “El Taxi” and “Chi Chi Bon Bon”) is someone who’s building up a name for himself right now. He’s where Gente De Zona were five years ago, when I was first dealing with them. I love to catch artists before they explode because then we can build a really good relationship. I had a record called “El Taxi,” and he loved it and he asked if he could shoot a video. I said yes, and sure enough, he’s exploded the record in Latin America. It has more than 28 million views [on YouTube]. It’s a record that’s become huge through the streets. You have another up and comer, El Micha. I don’t have a problem doing records with new artists because I know what It felt like to be able to get that first feature and say, “Wow, this is the opportunity that’s going to allow me to take my career to the next level.” So, it’s always an honor to be able to do that. I’ve been recording with Gente De Zona since my first Spanish album, for example. I’ve been dealing with them since ’08. There are a lot of Cuban names here: El Micha, Osmani GDZ. Did you specifically want more Cubans? Not even. They are guys that are working very hard in the streets right now and I understand that fight because I’ve been there. But, Fuego (featured in “Mami mami”) is Dominican. Don Miguelo is Dominican. Papayo (featured in “Haciendo ruido”) is Venezuelan. In one way or another we’re working with all Latinos, and with the world. Mohombi is African. He’s a great guy and these guys that we’ve worked with are guys who will have great careers in the near future. A lot of the music in this album is very street and very different from some of the big pop records you’ve put out in recent years. You have records for the clubs and the streets. You have your huge records like “Baddest Girl in Town” which has sort of a Michael Jackson feel to it. You have “Haciendo ruido” with Ricky Martin which has a big world feel to it. And “Hoy se bebe” with Farruko has a big world feel to it also. “No puedes más” with Yandel [which references “Don’t You Want Me Baby”], there’s nothing in Spanish radio like that. The Yandel record has that ’80s feel to it and it reminds me of ’80s music and freestyle music. That’s my favorite record on the album. We’ll be working on these records for the next year and a half, two years. That’s a long time to work in Spanish. Will you lose your mainstream clout? Not at all. When Piensas was out I had “Times of Our Lives” on the charts [it hit No. 9 on Hot Latin Songs]. Now “Fun” is at No. 40 and we’re working “Baddest Girl in Town” in Spanish. To me, records are like air traffic control: I make sure they can land and that they have enough airspace to be able to breathe. I’ve used that analogy not only for records, but also for PR, for social media. People think that by just throwing things out there people are going to get the message. But what they need is a clear runway to take off and land. Aside from promoting the album, what are your plans for the near future? I have a Las Vegas residency Sept. 23 to Oct. 7 in Planet Hollywood. It’s called “Time of Our Lives.” We will be on tour next year. And I’m already recording English records for the new English albums. My mom used to say the two biggest diseases in the world are greed and ignorance. I think Trump is far from ignorant, but I don’t think he really understood what he was saying and the power of Latinos. [He didn’t understand] how we’re always united, and how we truly respect this country way too much; we respect the liberty it gives us to control our own destiny, and the opportunities it gives us to take our families to other levels. I don’t think he really put all that together. But, to each his own. El tipo se comió tremendo cable! [The guy is in hot water]. Previous Previous post: Pitbull Rehearsing for Premios Juventud with Wisin and Mohombi! 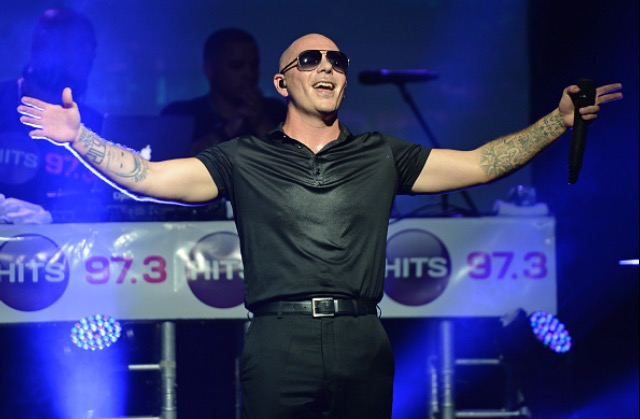 Next Next post: Pitbull at Premios Juventud 2015! Pitbull Updates – A Pitbull Fan Website Pitbull gets Interviewed by Billboard.